Alright, so we've finally shelled out the necessary dollars and copped a couple of decent quality suits, then took them to the tailor and had the sides taken in, pants tapered, etc. Fit is now on point, so we take every excuse we can to bust those bad boys out assuming you don't have to wear one to work every day. Unfortunately, as with anything else we wear, it's bound to get dirty and so we take it to the cleaners after a couple of wears, right? Well not necessarily. Getting your suits dry cleaned all the time can actually reduce their life span because of the chemical process involved in dry cleaning. Personally, I now reserve dry-cleaning for stains or something similarly major. After I shower, I typically brush my hair to get it looking right, and maybe other times during the course of the day. I do this to make sure that I don't have any random particles in it or on my head and to keep it looking good. Same thing applies with suits, particularly those made of wool. In order to ensure that a suit lasts as long as you would like it to, along with occassionally dry-cleaning, brushing after every wear is the best way to protect your investment. 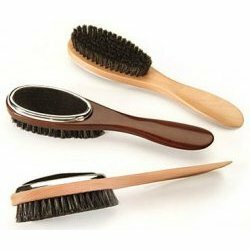 As seen in the image above, a suit brush looks just like your regular hairbrush with a wooden or plastic body/handle and synthetic bristles or real animal hair if you fancy. When it comes to my suits, I prefer to go as fancy as I can afford so I advocate buying a quality soft men's suit brush with natural animal hair because you don't get bristles that are too coarse that could potentially damage your suit. So where do I buy one, you ask? Here's where the good old "innanets" comes in handy. Depending on how much you are willing to spend, you can find them anywhere from $10 to a few hundred for a vintage hand-made brush. Just google. The fabric of a suit wears over time as dirt and unseen particles build up which eventually affects the integrity of the fabric causing it to weaken and stop looking as good. A decent suit brush will help you prolong its life. Quick Hint: Just like shaving? Brush downwards. In my opinions, hangers are crucial when it comes to suiting. I once went to a tailor to get some pants altered and took the suit jacket with me by mistake. This guy decided to keep the pants on the hanger I brought it and gave me the jacket back on a wire hanger. I'm pretty sure I cringed visibly. Your choice of hanger can help maintain the shape of your jacket and ultimately help it last longer. For the most part, we know what a good suit hanger looks like with the wide shoulders. Now, again like the suit brush, it's up to your pockets to determine how much you want to shell out for one. 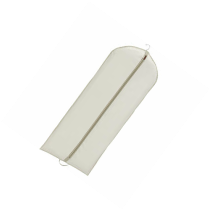 The suit hanger will also help smooth out any wrinkles that you end up with during the course of your day, whether its from driving or leaning up against a wall. If you do wear suits to work and take off your jacket during the day, I advise keeping a hanger at the office versus hanging it over the back of your chair as this could impact its shape as well. Along with a good hanger, a suit bag, specifically a cloth one can really also help with protecting that suit collection you've been working on building. Why cloth instead of the plastic or canvas joints that you sometimes get when you buy a new suit? Well, cloth allows air to pass through the bag which allows your suit breathe. Usually you want to wait a day or so after wearing a suit to put it into a bag. The air flowing through the cloth bag will help protect the suit from moths and wrinkles. Realistically though, while I wish I could put all of my suits into a cloth bag with a decent amount of space between them to really allow room for air flow, I don't have the closet space for it. So I have a few suits that I do really like, so they get what I call the "special treatment."